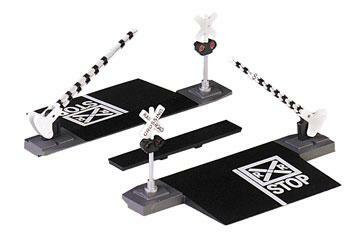 This is a Bachmann Road Crossing Set for use with all HO Scale train layouts. Recommended for ages 8 and over. Retail $20.00 SAVE 37% ! "good product, nice addition to the layout"
good product, nice addition to the layout as there was a need to have a crossing in one location. only slight negative: would have liked the sign posts to fit in the slots more securely, no worry though as added glue to make the posts secure in the slots. For use with all HO scale train layouts. Plastic construction in black and white colors. Authentic replicia is detailed and adds life to layouts. One piece molded crossing: two lane pavement (black asphalt) is marked with RR warning sign ("R X R STOP"). CROSSING" and two flashing red lights). The entire set up looks great and very realistic. I was a bit disappointed though as the description was a bit misleading. operating accessory meant that the gate arms move up and down and not that it has flashing lights as mentioned in the detailed description. Also it states that this can be used in any HO layout. Not quite true. If you are using EZ track, this set is to low and you will need to use some sort of base to bring it up to the level of the track. "The 2 yr old loves these"
We couldn&apos;t find crossing arms anywhere locally. These are working great with a Thomas and friends snap together track, but they are a bit fragile - so teach the kids to be gentle. This is the type of HO gauge accessory I like. Realistic, easy to assemble and a great addition to any model train layout. Keep this product safely away from small children.